Tamarillo – Solanum betaceum is a very distinct fruit that people tend to have a polar opinion of and either very much like or dislike. It has a fairly tart flavour and can be used in either a desert or as a companion for any dish that needs an acid lift. If it is not fully ripe it can have a very strong acid taste. It is always best to leave it to fully ripen if possible. This happens when the skin takes on a significantly darker colour just under the surface and the fruit starts to soften to the touch. It is a fairly hardy small spreading tree that can get to about 4x4m or bigger if happy. 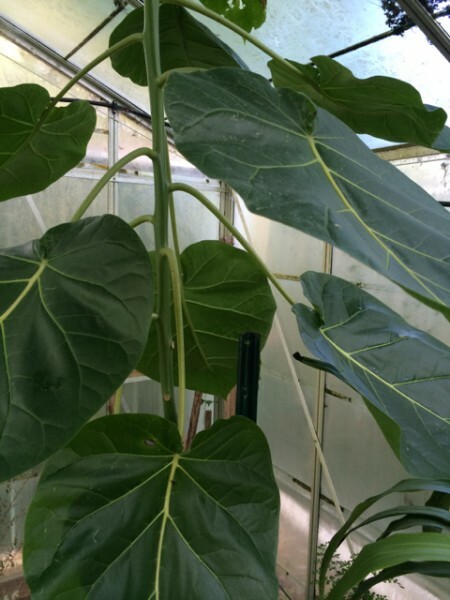 It has very large tropical looking leaves and the main stems are fairly soft and can get damaged fairly easily when small. The leaf and stems will often drop off with little pressure – however they also grow fast so will compensate quickly. This is a photo of the main stem of a yellow fruited Tamarillo plant growing in a cold glasshouse. The leaves are about 30cm wide and 40cm long. It is coming into it’s second year of growth since planting out as a cutting. I wait till they reach the roof and then trim them off so they branch. The plants grow and branch quite quickly but the first year they are very liable to being knocked over by wind or other direct physical force. They are generally a soft wood until the main stem is a few years old. This also marks the point where they become less cold sensitive. The main stem will eventually develop a thick skin and be quite big and strong enough to hold the 3-5m bushy tree vertical. Even if it falls over – just leave it to grow on and it will generally establish new extra roots where it touches the soil. Grow them in a warm space maybe near a brick wall to help protect from wind and cold snaps and to increase radiant heat on them. When I was growing up there was a 5m tree growing in a brick walled courtyard space next door to us for many years and producing huge crops of pendulous fruit. If you are in a fairly cold climate then growing them in a glasshouse is a good option. They will handle cold periods down to about 1degree C ok as long as they don’t get direct frost or wind with that cold. If you grow them inside watch for aphids and other sucking insects that can quickly become a real pest with them as they have very soft skin on leaf and stem. They usually will flower in the first year after cutting but the fruit set tends to be fairly small for the first two years. They are pollinated by ants and hover flys or other flying insects much like happens with tomatoes and potatoes etc. It is best to encourage them to branch out by trimming the end growths when they get to the height you want – then they turn into much branched small trees. If you are growing them in a closed greenhouse then you may need to hand pollinate with a paint brush. The flowers that grow in clusters are small and insignificant. The trees look spectacular when loaded with the fruits all hanging down below the canopy of large leaves. There is not a lot of variation in fruit size. The colours are usually dark red, yellow or a cross that is orange. They all taste pretty much the same to me when ripe – but some say the red is stronger in flavour and acid. The branches can be easily trimmed off and used to strike cuttings and that is the best way to rapidly increase the number of trees you have and keep them healthy in the longer term. Just push a cutting of about 3 leaf nodes (with a few existing leaves at the end) into some good quality potting mix in a 12inch pot and make sure at least one node is below the surface and you will have growth quickly. Make sure to keep it well watered and warm till it shows new branching growth at a leave node. They like lots of moisture at the root level and a thick mulch and lots of manure etc. They grow quickly and will respond like most solanums to fertilisers balanced as for Tomatoes and eggplants etc. They are very much like a very large eggplant bush. They will slow down if they get cold and not enough light – however they can be grown in part shade and seem to cope ok. There are several colours available but I like the dark red as I think it has the better stinger flavour and looks better – especially the dark red juice that stains everything around it. Eating them fully ripened and raw is really tasty – they need to be at the stage where they can be just squished or spooned out of the skin. But the way I find best to eat them is simple – put them in a small sauce pan in cold water just covering them and bring to the boil – the second that the skin splits they are ready to eat so you just spoon them out and drop them into a bowl with a giant slab of vanilla ice-cream and watch the juice run… eat them while still hot. – spectacular colour juice and only matched by beetroot juice with intensity. 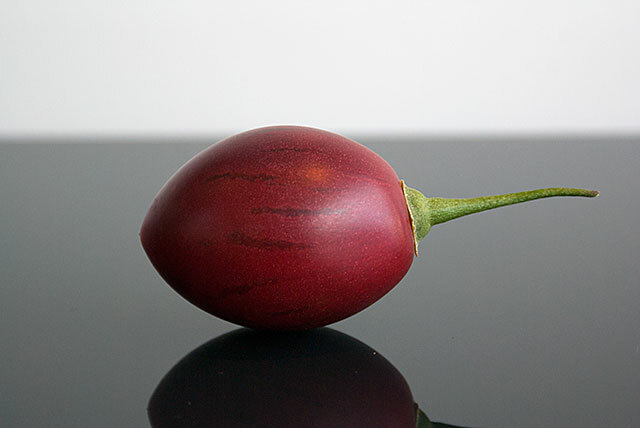 The name was originally just the generic Tree Tomato till the late 60’s when NZ growers created the name Tamarillo for better marketing possibilities.